Sunday morning I woke up with a crisp chill in the air throughout the house. It was actually a little cold, Fall is definitely upon us! I still refuse to turn on the heater, I love it when you can turn all air conditioning and heating off and just crawl under a warm blanket. Not to mention I love the lower heating bills. I swear they love to rip you off in the winter months. 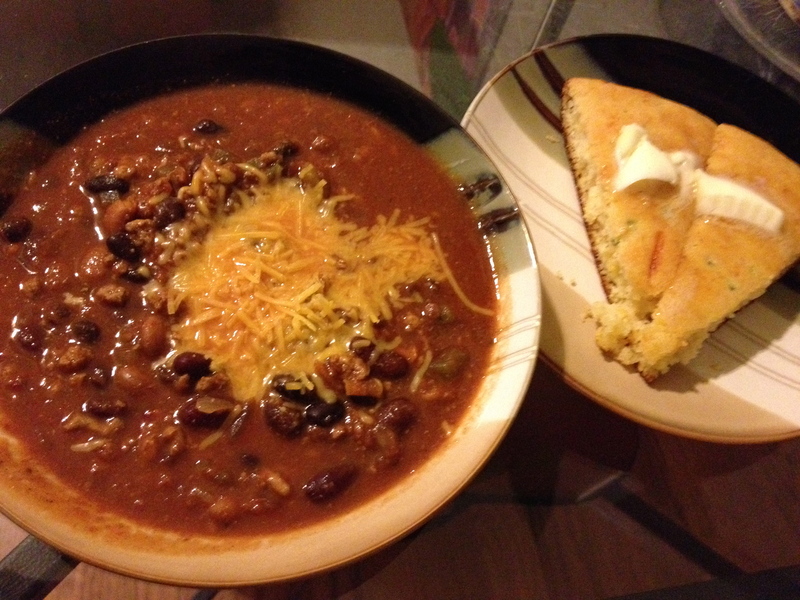 Because of this crispness I had a craving for some homemade chili and corn bread… I mean is there a more perfect meal on a cold day? So I had it in my head that today I am going to make chili! A few years ago my sister bought me a crock pot and I have only used it once I believe. My family never used a crock pot growing up so I have no recipes to follow or training on using it so it has sat on my kitchen counter just looking pretty. She really did buy me a pretty one! It sits right nice to my gorgeous Hot Rod Red Kitchen Aid mixer!… that I use all the time!! I decided if I am going to make chili than I am going to make Crock Pot Chili! I started researching online and found a few popular recipes online but none that looked good that were Crock Pot recipes, so I decided to invent my own and boy did it turn out delicious! It is the best chili I have ever eaten and my daughter boyfriend literally moaned when he took the first bite! We stopped at our local farm stand at Isom’s Farms and purchased fresh picked green peppers, onions, and jalapeño peppers…. nothing better than fresh local grown produce! The rest of the ingredient we just picked up at the local grocery store. Here is the best Crock Pot Chili Recipe EVER!!! Heat up Crock Pot on medium-low or low. Heat the oil in large pan and add the turkey, cook until browned. Add turkey to the Crock Pot. Add all remaining ingredients to the Crock Pot and stir completely. 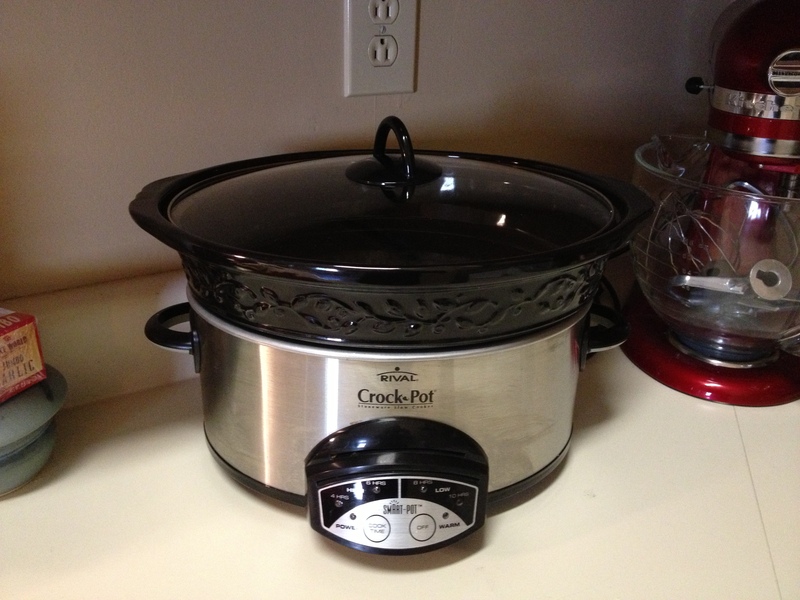 Leave cooking in Crock Pot on Low for 6 hours, Medium/Low for 4 hours, or on High for 3 hours. ** Remember to taste the broth as you go and see if it is seasoned to your liking. On the dry ingredients I just estimated what we put in there, We tasted the broth a few times till we got it perfect. We were trying to be a little healthier so we used turkey but you can definitely use ground beef instead. If you like your chili extra spicy you can add more adobo sauce or add cayenne. The next day leftovers taste really good on top of a burger… yum chili burger! Cooking is all about experimenting! I promise you will not be disappointed with this recipe! Once! I usually have to replace my crock pot at least every couple of years because I wear it slap out! When you work, it becomes your best friend, especially in the Winter! Did you know you make just about anything in the crock pot? Anyway, this recipe sounds great! However, my husband would never let me make any chili recipe abut his. Besides, any time I have tried making chili it ends up tasting like spaghetti! Ewe. Chili is not my forte. I am a great cook but not with that. Well you will have to share some of your favorite recipes with me. I plan on using it a lot more! I seem to use my crockpot for a while and then forget about it. I wish I had enough counter space to keep it out because then I would probably use it more often! I am going to try this. It loosks and sounds really good. Thanks for sharing it! It really was! I am adding this to my family recipe box. I guess I should have posted the corn bread recipe as well. Don’t worry about it though. I have mine on my counter and I forget to use it. Sounds great! I’ll pass this on to The Gent. Thanks for participating in the Friday Social again. You two will love it! I need to make it again. It’s starting to feel a bit cold out there again! I have to say that here in texas we are a tad bit on the chili snob side. I’ve made a couple variations of chili and never really just had the wow factor. UNTIL, yesterday…. This is hands down the best chili I have ever allowed to grace my taste buds. I did add extra seasoning but that comes with whatever your flavor savor wants and I cut out pintos because yuck and added an extra can of kidney beans. Regardless, the flavor of this is ahhhhmazing. The boyfriend stuffed his pretty little face and my stepmom even came over to steal a bowl. Texas approved!!! I am so glad that you liked it Christie. I think all recipes are made to be adjusted and to play with! I’ve made this recipe twice now and it’s definitely my new go to! Fresh produce tastes so good. I replaced the tomatoes with tomato sauce, because my kids will flip if they find a tomato chunk. But awesome recipe! I’m so gladto have found it! Thank you! It is one of my go to recipes. So many possible variations as well. Thank you for your input!